Moorfield nanoPVD systems are high-performance magnetron sputtering units with DC and RF power supplies (for both metal and dielectric coatings), 2” target diameters, and base pressures in the 10-7 Torr regime for high-quality films. Compact as an electron microscopy coater, but with the results of research-grade instrumentation. 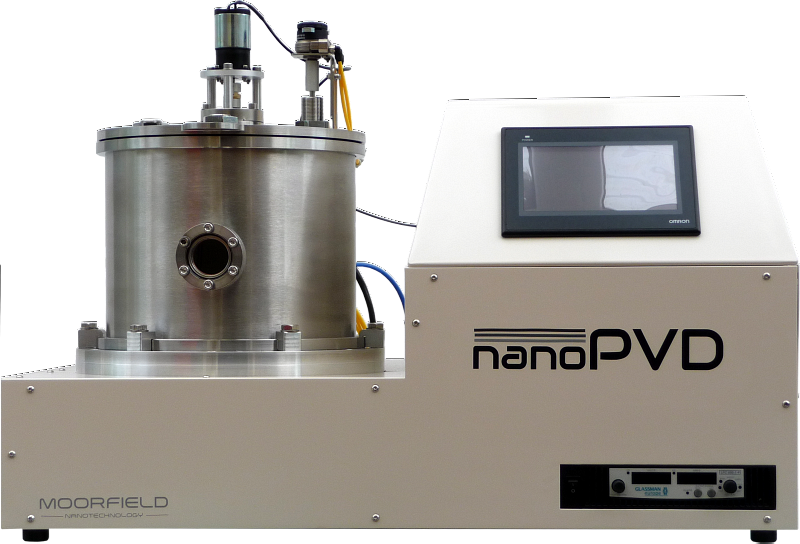 Moorfield have recently introduced the nanoPVD series of benchtop deposition systems. In contrast to microscopy-application products, nanoPVD systems are derived from proven R&D thin-film system technology, developed through extensive collaboration with leading academic groups. nanoPVD products are extremely compact and optimised for ease-of-use, without compromising film qualities provided. They represent outstanding value for money. Vacuum hardware: Al and SS-304 construction. Vertical cylindrical chamber 250 mm (h) × 225 mm (i/d) with Viton o-ring seals. Optional viewport on front elevation. ISO63 pumping port with integrated throttle valve. Hinged top-plate with the following ports: Central NW40CF for platen rotation and platen Z shift, 3 × 1” bolt baseplate ports for heater power and thermocouple connections, and shutter actuation. Baseplate: 3 × inclined angle ports for confocal cathode sources; 1 × central port for on-axis cathode source; 1 × quartz crystal sensor head port; 1 × gas admission port; 1 × vacuum gauge port. Safety interlocks for water, vacuum 1 and 2. Pumping group: Edwards EXT75DX water-cooled turbomolecular vacuum pump, vent valve, SS304 KF16 backing line to Edwards RV3 dual stage rotary vane vacuum pump (or Edwards nXDS6i dry scroll vacuum pump). Edwards wide-range gauge (option for Inficon high-resolution capacitance manometer). Substrate: 2” standard sample size (up to 4” option with DuoDep module). 24 Vdc variable-speed platen rotation. Optional DuoDep module changes system geometry to allow for uniform coating of 4” substrates by utilising Z shift. Optional rear-side sample quartz heating in reflector dome. Sources: Up to 3 × 2” fixed position, water-cooled sputtering magnetron cathodes. Standard-strength magnet pack, or optional high-strength magnet pack for magnetic materials. Magnetrons accept industry standard targets from 1/64” to 1/4” thickness. Power supply options: 150 W RF generator with auto-matching unit. 850 W DC power supply. All supplies operated automatically by PLC software. Power supply switching: Plasma relay switch allows each power supply to be connected to any source for sequential deposition runs. Options of 1 input with 2 or 3 outputs, or 2 inputs with 2 or 3 outputs. Pressure control: Standard pressure control is via fixed throttle valve and software-controlled MFC gas flow. Optional PID loop with baratron gauge allows for +/- 0.2 mTorr pressure control. Up to 3 MFC gas channels, SS316 seamless tubing gas feedthrough. Process gases: 25 psi supplies and clean lines, 99.99% purity or better. Service gas: Dry compressed air, nitrogen or argon, 60–80 psi supply. Vent gas: Atmosphere, or N2 at 5 psi. Power: Single-phase 230 V, 50 Hz, 10 A. Chilled water: 18–20 °C, 1 L/min, pressure < 4 bar.